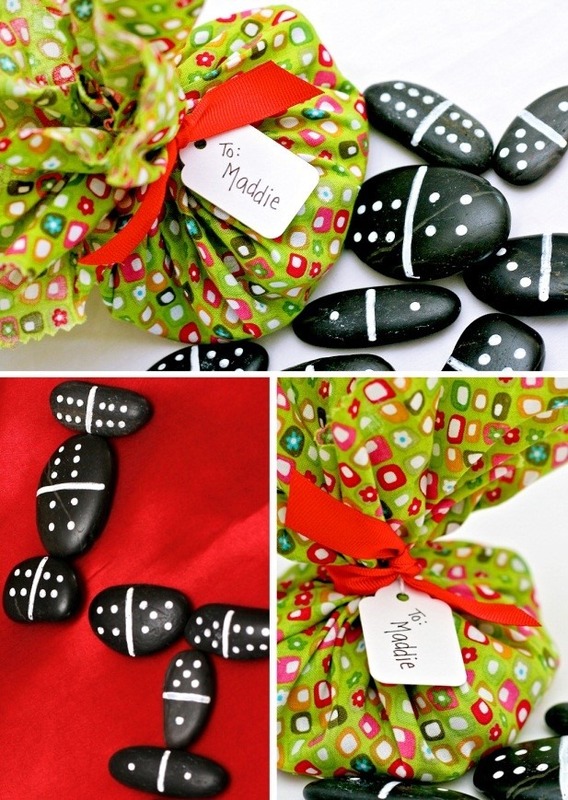 Making craft rocks with some DIY easy rock painting ideas can be a really fun activity to do with your kids. The main activity will be rock painting which is fun and easy for kids. Brighten up your garden and yard with some colorful rocks that you make. Sometimes, people enjoy this activity as a weekend fun project with their children. The material for this rock painting activity is really easy to find. Rocks can be found almost anywhere especially for you who lives near the beach, river, or even a forest. 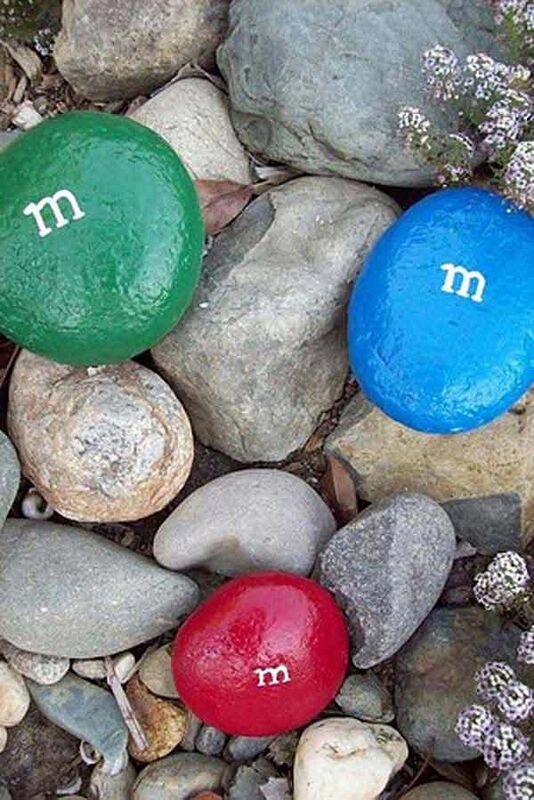 Prepare some paint with various colors and get creative with the rocks. That’s why craft rocks are considered the most affordable crafts. The paints – You can use all kind of craft paints including acrylic and water-based paints. For applying the paint in detail, you can use paint markers. It would combine the paint texture with the fine-tipped pen’s precision. One thing you need to remember before you touch the paint is to protect the surfaces and your clothes. The Brushes – The traditional paint and brush method can’t be combined with the expensive fine art brushes that you have. This project won’t need that fine art brushes because the surface of the rock is rough. It would ruin your brushes easily, so it would be better if you use the tools that you are not so precious about. The Rocks – It can be some simple small stones, rounded pebbles, and smooth-surfaced ones. Find it in a place that you are allowed to take those. You’ll need to avoid protected areas or some national parks. Or, you can just purchase it from the garden centers. Well, you are now well prepared. It’s time to get some inspirations to apply the painting with these wonderful DIY easy rock painting ideas. This craft rock project was created for garden markers. It adds a pop of colors all over the garden. It would make a garden is not just gonna be an ordinary garden. It would become more interesting and fun. 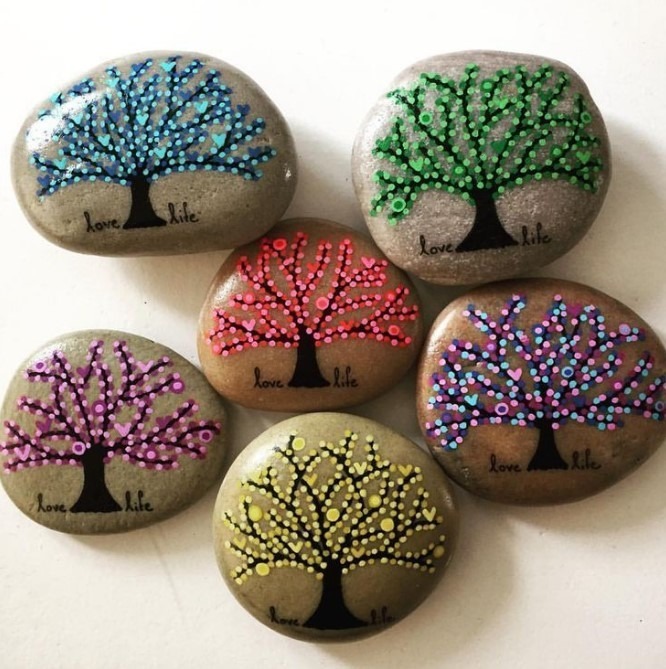 You can also give this craft rocks to your friend as a gift. Get your hands on some rocks. Then, you can start to coat the top half of the rocks with acrylic paint’s layer. After it’s dry, paint the stone with the color that matches well with the base. From this step, it’s all up to your creativity. Finally, let them dry. 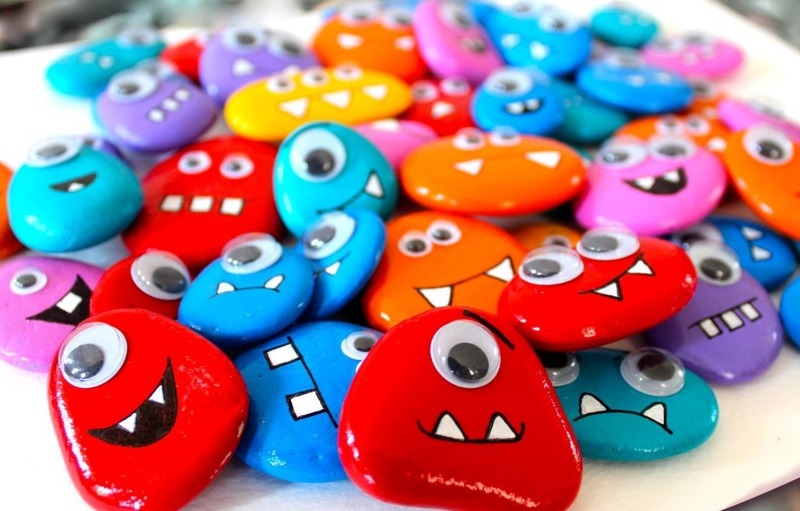 Besides decoration and functional marker, craft rocks can be a great learning partner for your kids. If your kids are still learning numbers, this could be a perfect idea to let them learning number in such a fun way. As you can see, the craft rocks are completed with a tote bag that could carry the rocks anywhere your kids want. 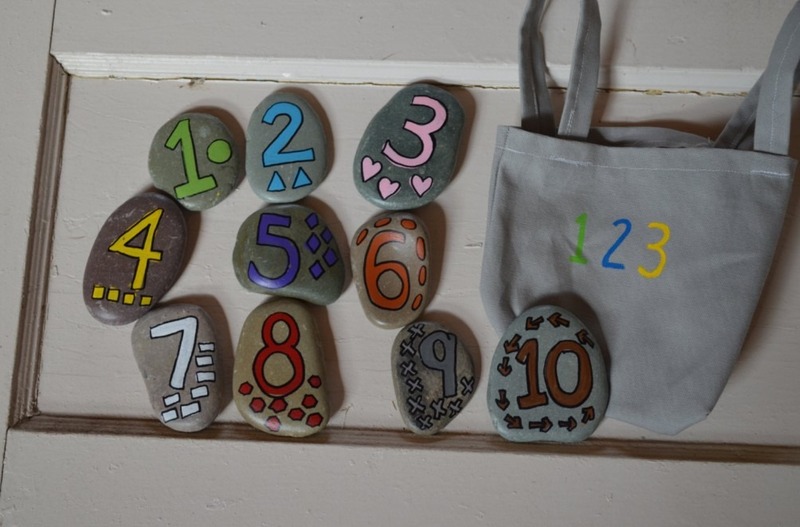 Paint the surface of the rock with gray coating base, then paint the numbers with any colors you want and add some simple graphics for variation. Your kids can help you up in applying the paint. 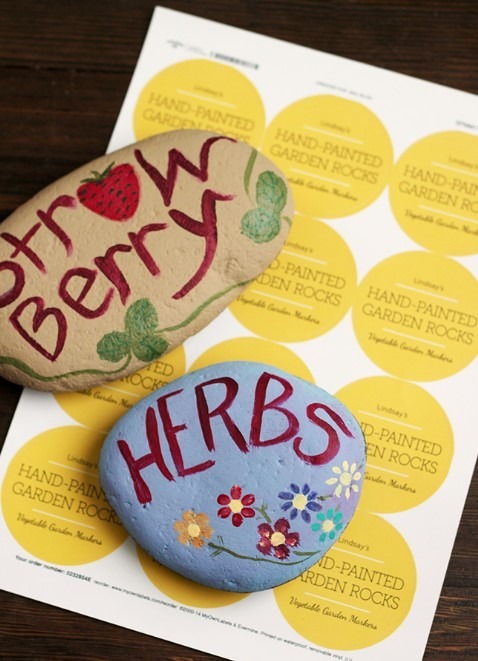 This rock paint for kids project would be fun for them to create their own learning tools. Wanna have your own personalized stone? 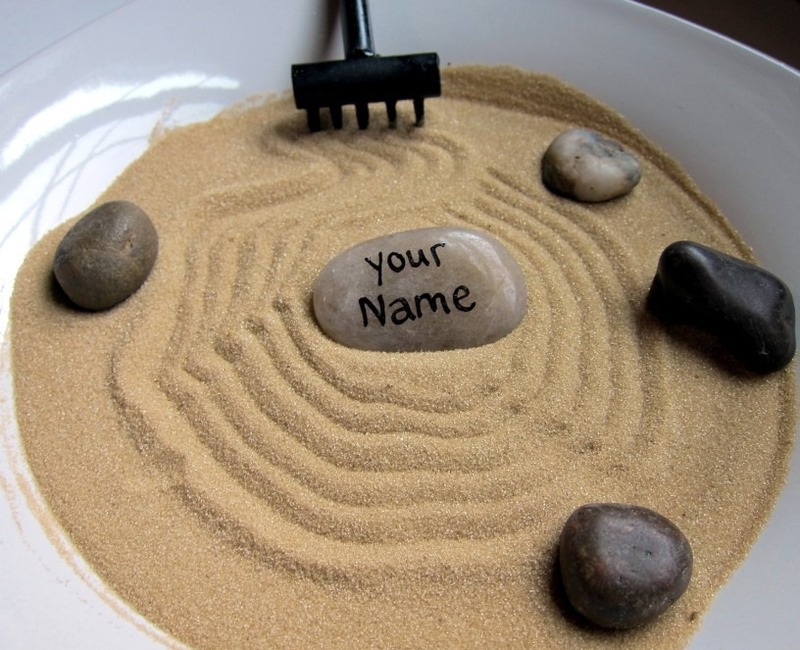 You can just paint the stones with your name on it. For example, if your name is Chloe, you could write “Chloe” with your tiny brush. The key to this craft rocks is the natural look of the rock itself. I guess this, you have to work a bit harder in finding the stones with an elegant pattern like those. So, the effect of zen would get even better. This DIY easy rock painting idea is probably the simplest one. In this case, the step of painting and coating is not necessary. The stones need to be cleaned carefully to get the shining effect. As you can see, this set of the mini zen garden in perfect for meditation and relaxation. Getting your pets on a rock? Why not? I don’t mean literally. The image of animals your pet can be painted on the stone. It requires the ability to draw and paint on the stones. If you have no talent for drawing and painting, maybe you need to hire someone to draw it for you. 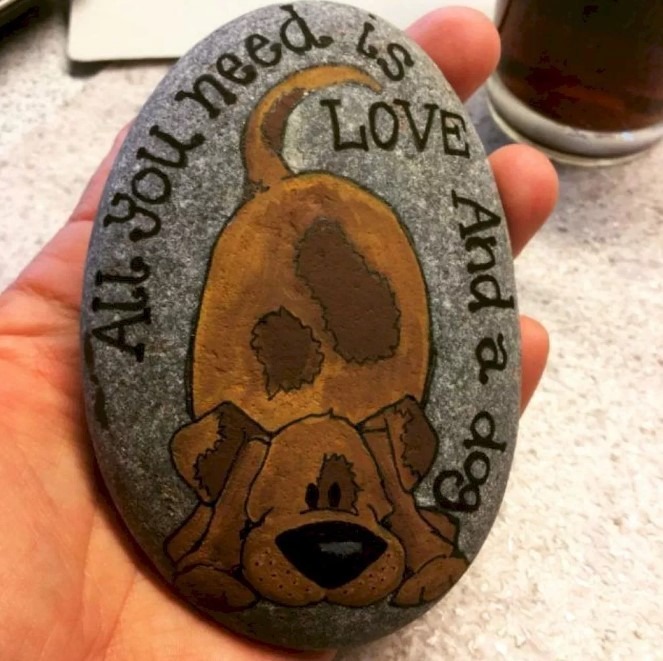 This sweet stone art is perfect for any dog owner. The image of the dog is really friendly on that photo. It will be okay if you want it to be a cat instead of a dog, according to the animal you pet. The rock in the photo says “All you need is Love, and a dog”, you can always replace a word “dog’ with anything you want. If you are interested in stone art, this one might get your attention. Some DIY easy rock painting ideas are not always easy. It depends on your ability and creativity. 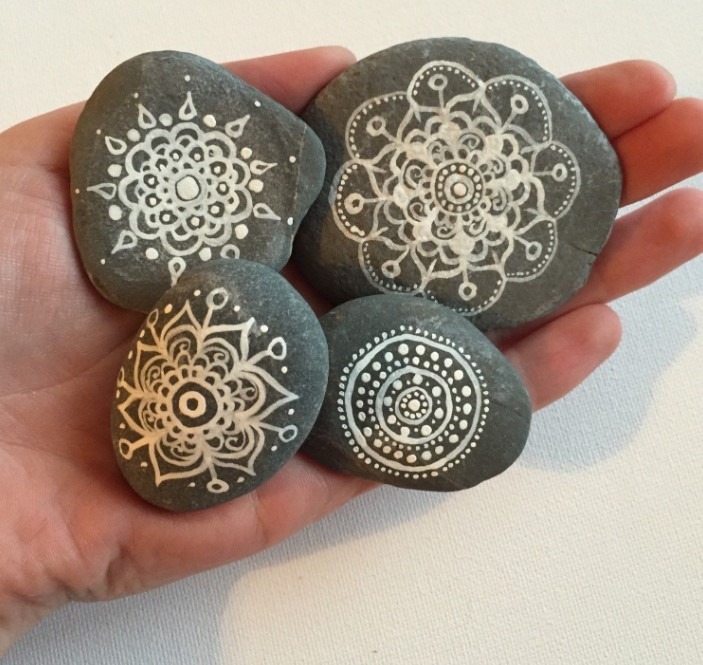 If you can be a little bit artistic in feeling, you can create a stunning decoration with the craft rocks you make. For you who don’t have the ability to draw an artistic image like this henna graphic, you might need to follow some tutorials, or learn to draw it step by step. 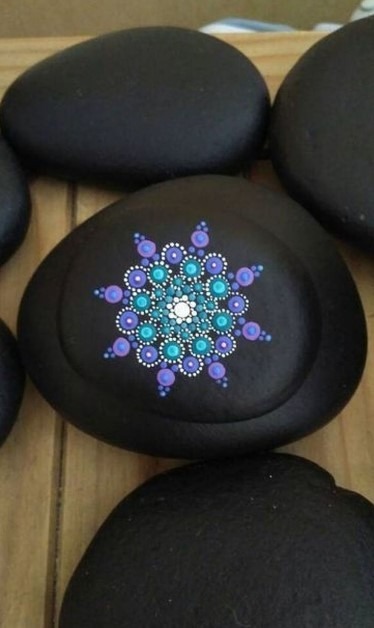 As you can see, this henna painted rocks looks extraordinary. It only uses white paint to apply. The rocks are kept in original color and surface. It’s a great idea for natural decoration for your interior. Some funny characters would increase the level of fun in rock painting. Enjoy this activity with your children. 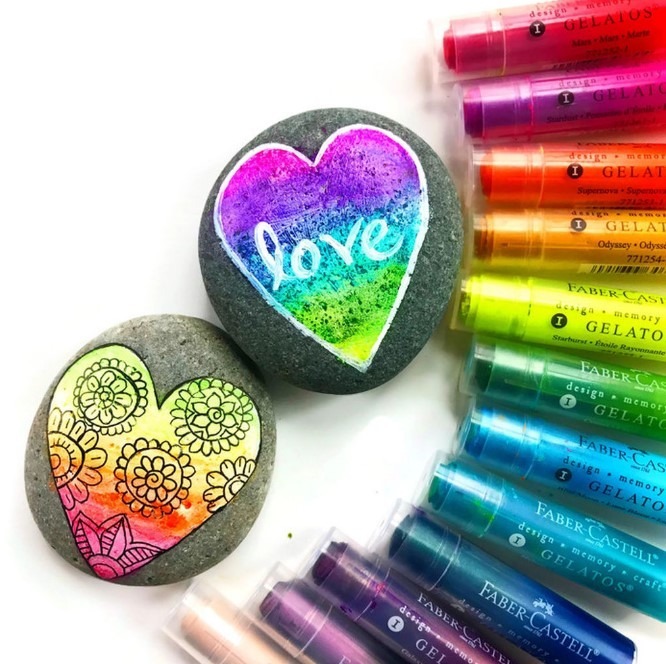 They’ll love to play with rocks and mix match them with colored paints. You’re gonna need some flat rocks with the shape you want. Then, apply the surface with acrylic paint for the base. There are two shapes of rocks you need to prepare in this case. The small ones for the heads, and the tall ones for the bodies. In order to ignite the creativity of your children, this fun kid’s rock painting project is perfect. Let your kids be creative based on their imagination with this fun activity. Some motivational quotes might be the one that will improve your mood. Some people would have been searching for inspirations and motivations everywhere they want. But, you can actually create your own version of inspiration in a rock. There are so many motivational quotes out there. It might come from inspirational figures you love. You can also create the motivational quotes from your own words. Check out this stone of inspiration. 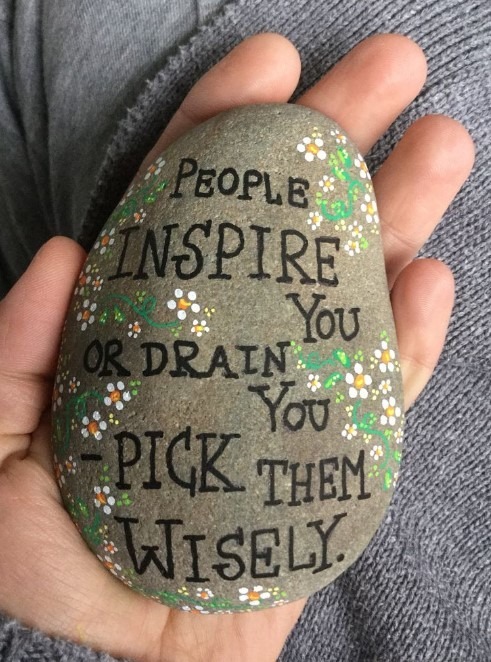 It says “ People inspire you or drain you – pick them wisely”. This is the quote that might ignite your spirit of life. Looking for a unique idea of stone art? This one could definitely please you. It can be an additional pop of colors that make your garden looks more interesting to the kids. It’s very clever to choose M&M as the inspiration to this craft rock’s design. M&M pieces are colorful and easy to imitate. It only requires the solid base with acrylic paint, then writes an “m” in the middle of everything. If you want to give a unique present for your loved ones to make them more special, this idea could be a great one, to begin with. Actually, the lovely craft rock in the picture is the watercolor-inspired rocks that were covered using craft gelatos colors iridescent product from Faber-Castel. Its beautiful color is fabulously making the rock more impressive. The gelatos from Faber Castle is perfect to create a beautiful base for words or doodles on it because of its watercolor-like feel. In order to make this beautiful and romantic rock painting idea, you’ll need the Faber-Castell Gelatos, white acrylic paint, brushes, and sealant. It seems like day by day, Halloween is approaching. Your kids probably already decided which costume they’ll wear on the scary and fun night of Halloween. Besides costumes, the decoration is also one important element of Halloween. Choose the simple ones for Halloween decor like this painted monster rocks. This is one of the DIY easy rock painting ideas that are perfect for the Halloween. Those little monster will look cute to be laid down around your house during the Halloween. You will need to prepare some stones, acrylic paints, paintbrushes, and a pencil with an eraser. That will be enough to create your little monsters. This artistic rock painting idea is inspired by the vintage Mexican pottery. Lots of colors are used in order to create this amazing work of art. You can actually find the inspiration everywhere else in the word. But, if you want to recreate this colored flowers on that stones, you may start right now. You have to prepare Some Americana acrylic paints which are the best product for rock painting, smooth river rocks, and Gloss varnish from DecoArt. You need to begin with base painting front and back. Paint the petals around the middle using a round brush. Then, paint a smaller doy in the middle of that with different colors. After that, you can begin painting over the petals with another contrasting paint color around each of the flowers. In the photo, it’s used red with blue, yellow with orange, and green with blue. Then, you could finish the work by recreating it according to the photo. This one of the most exciting DIY easy rock painting ideas. Besides decoration, this pebble domino can also be played as a real domino game. It could be a thoughtful gift for loved kids. This pebble domino game can be purchased in the Martha Stewart website, but it would be better if you make it yourself because the project is fairly simple. You’ll need some material such as black river stones, domino template, and white colored medium-tip paint pen. The number of stones is the same as the domino game pieces, it will be 28 stones to find. The pebble needs to be flat and black. Then, paint the pebbles based on the template. You can purchase the stones from the store or find it in the forest nearby. Washing the rocks are done to remove any debris or dirt on the surface. Painting the base should be done carefully using acrylic paint. The favorite part of rock painting is decorating, be creative in this part. A glaze seal needs to be sprayed to keep the stones weatherproof. A superhero character like Spiderman would definitely be loved by your kids and his friends. Kids tend to imitate their favorite superhero character, they would enjoy drawing it on the rock. This is one of DIY easy rock painting ideas that are pretty easy to do. 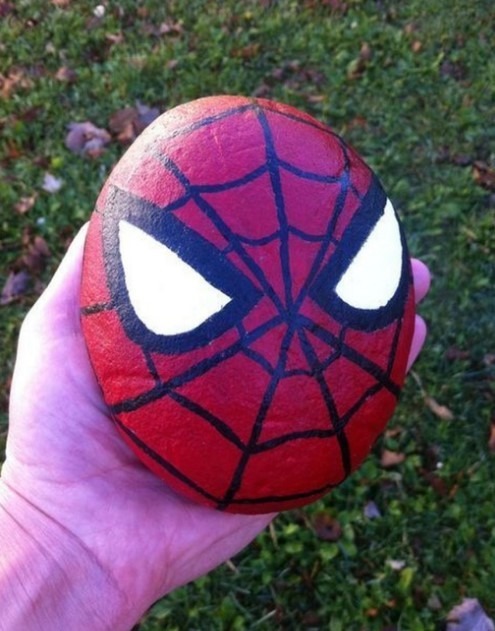 Spiderman is only one of the many superheroes out there that you can draw on your rock. Another artistic idea you can have as your decoration, this art-rock is called Mandala. The contrasting coating base is the key to this stunning mandala rock. That mandala painting shines the best in the middle of dark rocks. The setting in the picture could be a great idea for your room’s decoration. The zen is quite powerful to dominate your relaxing atmosphere. 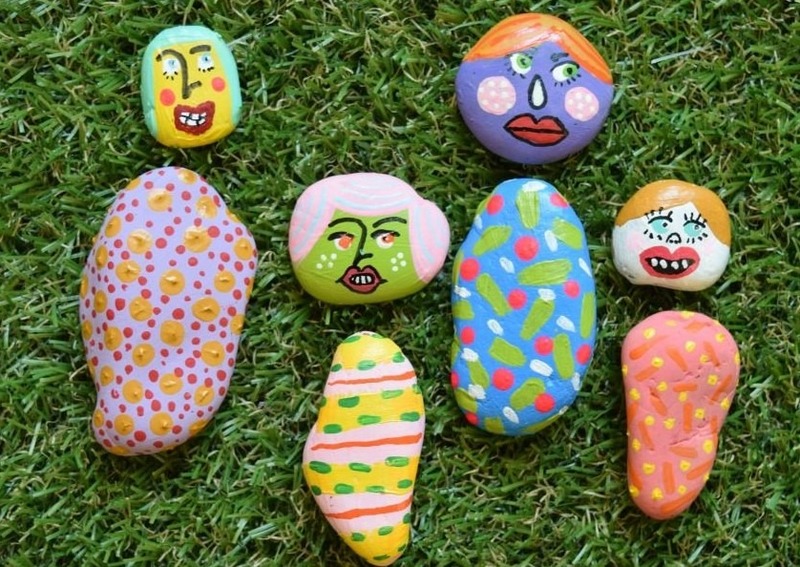 Rock painting is a fun project to be enjoyed by you and family. But, it can also be a serious project that would require artistic talent that you have. So, you may need to consider how complicated the idea is. 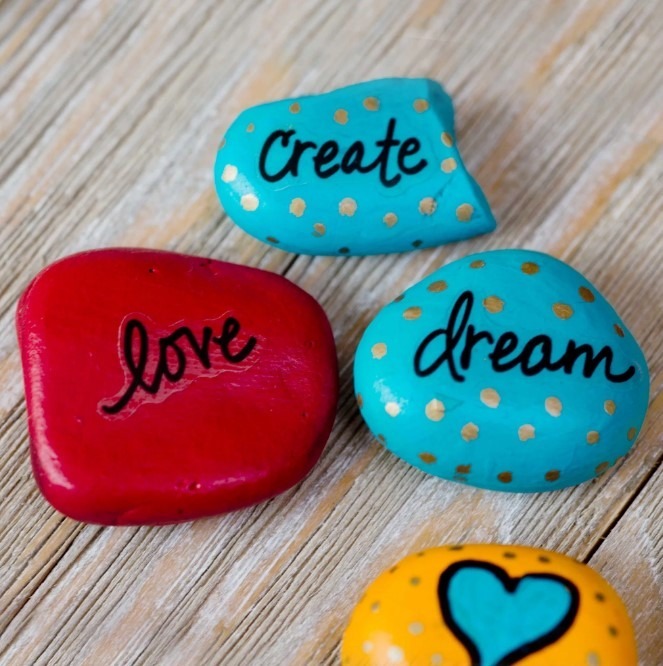 Choose one idea that meets your style in those DIY easy rock painting ideas above.